There are millions of people who are blind because of problems affecting the cornea. They can regain good vision by corneal transplantation (so called eye transplant). But the rate of eye donations is far less than the need. Therefore, it is an appeal to everyone to pledge to donate your eyes. One of the most noble deeds one can do. Can a living person donate his eyes? Eye donations are NOT taken from a living person, but are removed only from the dead. However, anybody can pledge to donate his eyes and his wish can be fulfilled by his kin after his demise. What part of the eye is transplanted? Although the entire eye is removed from the body but it is only the cornea that can be transplanted. Usually artificial or plastic eyes are put in the socket of the dead and eyelids stitched together to restore normal appearance of the face. All you have to do is to fill up a eye donation form available from any eye bank and submit it in the nearest eye bank. For your convenience eye donation form of the National Eye Bank is given below. You can take a print out of the form and post it to the address of National Eye Bank given at the bottom. In the event of death of the individual the relatives / kin are required to inform the nearest eye bank or the physician taking care of the individual about his wish of donating his eyes. They are also required to sign a consent form before the eyes can be removed. Will the relatives get to know the recipient of the eyes? No. The identity of both the recipient and the donor is kept a secret. Are there any payments involved? No. There are no payment or money involved for donor or for the recipient for the corneal transplantation i.e., there is no payment for the eye or cornea. (However, the recipient may have to pay for the operation charges). Open others eyes before close ours! The eyes we donate give sight to two blind persons! Make eye donation a family tradition! I Wish To Donate (In Shaa Allah - If God Wills) My Eyes After My Death. 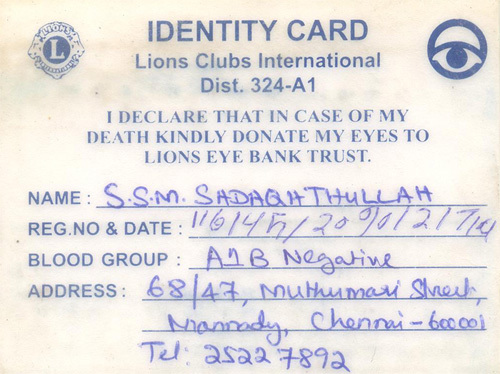 I registered as Eye Donor with the Chennai Lions Eye Bank Trust & Research Foundation. "There is no lovelier way to thank God for your sight than by giving a helping hand to those in the dark." There is a difference of opinion among Muslim scholars (Ulemas) regarding donation of eyes after death. Personally, I am more inclined to the argument put forward by Muslim Scholars (Ulemas) supporting Eye Donation. Moreover, it is a scientific fact that the Eye is 'alive' for nearly Six hours after a person's death. This - I believe - is the Will of Allah, so that our Eyes are useful to some other persons who are in need of sight - after our death. If Allah had not favoured Eye Donation, He could have so easily made a dead person's Eyes useless soon after death. Islam glorifies tiny deeds of favour done to fellow human beings, animals, even plants by human beings. Hence, I believe Donating Eyes - providing vision to someone who cannot see - after one's death would be seen very favourably by Allah - as an act of highest charity. This is my personal view only. Oh Allah! grant us forgiveness and show mercy on us. Oh Allah! strengthen our faith and guide us on the right path. Allah knows best. What is organ donation? Organ donation is the donation of biological tissue or an organ of the human body, from a living or dead person to a living recipient in need of a transplant. Experts say that the organs from one donor can save or help as many as fifty people. Most organ and tissue donations occur after the donor has died. But some organs and tissues can be donated while the donor is alive, without the slightest harm being done to the donor. People of all ages and backgrounds can be organ donors. Organ donation is a great boon of modern surgery. In previous ages it was quite impossible to have this kind of donation. Organ donation is allowed in every religious tradition, including Islam. Moreover, it is a highly rewardable act. An artificial transplant is no substitute for a natural organ transplant. According to Islam, organ donation is what is called Sadqa Jariya, that is, continuous charity. For example, if a blind person receives another person�s eyes after the person�s death and is able to see, then that is Sadqa Jariya, because even after his death the benefits from his donation continue to be received by another person. Organ donation is the greatest way of showing sympathy to others. In this sense, organ donation promotes a noble, humane spirit in society. It signifies living with the spirit of compassion for others. Organ donation means that one is desirous of extending one�s spirit of service to others even after one�s death. In organ donation, the donor loses nothing, but he gives others something which is more precious than even diamonds or gold. There is a saying: �The measure of life is not its duration, but its donation�. This saying applies most to organ donation. The application of this saying to any other thing is only partial, but its application to organ donation is in the fullest sense. Organ donation is not simply a donation. It is more appropriate to say that it is a kind of sharing. Every organ is a natural gift, and when a person donates his organs to others, he wishes others also to have a share in this gift. Organ donation is a kind of divine donation. God Almighty has given you an organ, and you receive its benefits. Every organ is entirely a divine gift. No one can make an organ, neither the donor nor the recipient. But when a person donates his organs to someone else, he does something that only the Creator can do: what a great credit for the donor! Charles Dickens once said: "No one is useless in this world who lightens the burdens of another." By donating an organ, one can prove oneself a worthy person in the noblest sense of the word. Is Organ Donation Permissible In Islam?